First of all, I feel like I am drowning in laundry. Yes, laundry is a part of life but as I was folding my kids clothes I realized that there are just too many of them. Part of that was clothing that needed to be sorted out, because it was too small or in disrepair, but even after the sorting I realized I could eliminate more. Next, came the realization that I am probably spending more than is necessary on kids clothes. 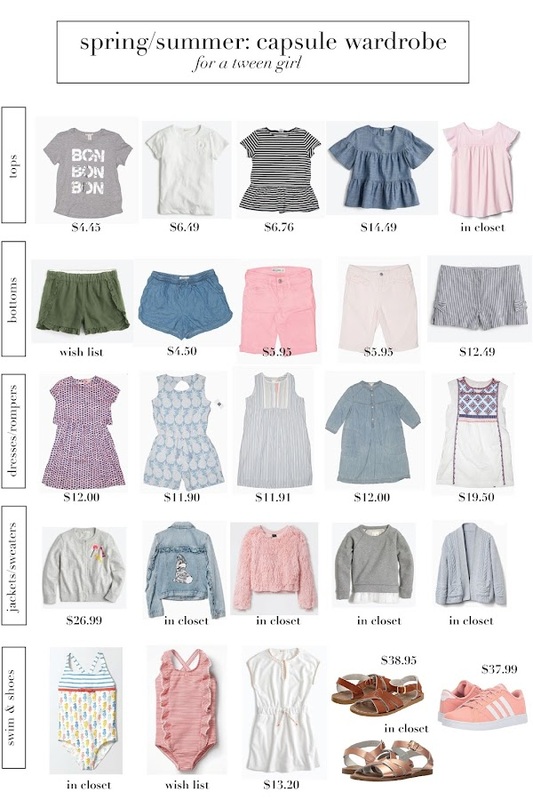 When it comes to their clothes, I want my kids to have items that will hold up, that are comfortable and that are styles that they like to wear, so I am somewhat selective in what I purchase for them and have been trying to follow the quality vs quantity mantra, but I realized that creating a capsule wardrobe would help me do better. Lastly, I decided that I should look at ThredUp for as many of their capsule pieces as possible. My train of thought for this was very convoluted, involving random thoughts on the desire to buy new things vs the need for the new things, the amount of clothing in landfills, how expensive kids clothes can be, etc. Regardless of how I got there, ThredUp turned out to be a goldmine for me so I thought I would share some of my insights on how I created this capsule. Full Disclosure: this post is NOT sponsored by ThredUp, and they have no idea I am writing it. Just passing along some mom hacks because I love saving money and making my life easier, and I figured some of you might too. The key to a capsule wardrobe is sticking with a limited color palette so that everything goes together easily. Which means that pulling together outfits will be a simplified process for my tween, and that will help eliminate decision fatigue, at least that is the goal. With her help we settled on, shades of pink, blues (mostly chambray), white, gray and hint of olive green for her capsule color palette. I also thought about how many pieces I thought she needed and worked off the general idea that less is more. We can always add if we need to, but I find it is a lot harder to take clothes away from kids once they have them, unless they are itchy. We then shopped her closet for pieces she already had that would work with the palette and transition well to spring/summer which is essentially the same season where we live in Texas and which I generally just describe as HOT. And I am pretty visual person, so I created a pinterest board for each capsule I'm working on. You can check out my daughter's board here. 2- Also, they are always offering promo codes so be sure to take advantage of them for even more savings. 3- If you see something you like, add it to your cart because usually there is only going to be one of that item and once it is in your cart it is reserved for 24 hours. So you will have plenty of time to consider everything and then remove items if you find something else. 4- Be prepared for slower shipping. We know we are spoiled by Amazon Prime but ThredUp shipping ranges from 3-8 business days which can seem like an eternity. Crewcuts Bon Bon Bon Tee via Thred Up (similar)- when looking for basics I still like there to be something a little bit special whether it is a fun graphic or an embellishment so this one fit my requirements and in my cart it went. Crewcuts Daisy Tee on Sale, I probably subscribe to way too many store email lists, but one of the reasons is that I like to make the most of my dollars and generally only buy my kids clothes when they are on sale. When J.Crew sends out the additional 50% off sale emails I usually find a gem or two and this was one of them. Crewcuts Striped Peplum via ThredUp (similar, similar), another versatile top with a cute peplum shape. Crewcuts Chambray Top on Sale, such cute details and once again super versatile- meaning she can wear it with leggings, jeans, shorts, skirts. Pink GapKids Flutter Sleeve Tee her closet (similar), soft comfortable and love the details on the sleeves. Crewcuts Ruffle Pull-on Shorts, I have these labeled as "wishlist" because I am waiting for them to go on sale before I buy. They are really cute, but I am not willing to pay full price for them and my motto is that "eventually everything goes on sale." Tucker & Tate Chambray Shorts via Thred Up (similar), easy pull on styling that will work with basically any top she has. Abercrombie Kids Pink Bermudas via ThredUp, I was only going to buy one pair of pink bermuda shorts and had my daughter select her favorite between the pale pink and bright pink, but when it came time to check out I was either going to pay for shipping or another pair of shorts so I picked the shorts. Anyone else hate paying for shipping? GapKids Pale Pink Bermudas via Thred Up (similar). Crewcuts Striped Bow Shorts on Sale, I am a sucker for anything with bow details. Crewcuts Heart Dress via ThredUp (love this one too), works for church and any events where she needs to be more dressed up. GapKids Pineapple Romper via ThredUp, my daughter has wanted a romper since last spring and we both loved the cute details on this: tasseled drawstring, buttons at the shoulders and the little cutout on the back. As an extra bonus, it was in their "new with tags" section so we snatched it up. Crewcuts Striped Dress via Thred Up (another cute option), I generally only like to buy items that are described as in excellent condition, could be mistaken for brand new. However, this one said there was a little snag, but I decided to take a chance to do a little comparison. If it doesn't work out when it gets here, I will send it back and get credit towards another purchase. Crewcuts Chambray Dress via Thred Up (similar, similar) a chambray dress was another item on my daughter's wish list and I have one on mine too, so I was happy to comply. Crewcuts White Embroidered Dress via Thred Up (similar), seriously loved the details on this and it will be great for the heat and humidity here. Crewcuts Candy Cardigan on Sale, I am thinking of this as a splurge compared to everything else I bought, but it will literally go with everything and my daughter was in love with the candy details. GapKids Disney ruffled Jacket her closet (similar), we picked this up when it was on sale and with GapCash. ArtClass Sweatshirt her closet (target), I'm not going to lie, this was an impulse buy. It was one of those times my daughter was with me and she was lured in by the softness of this and my parental resolve was low. Luckily, she loves and wears it. Crewcuts Factory Tulle Sweatshirt her closet (similar), this was on clearance when I bought it and it has been so versatile. GapKids Cable Cardigan her closet (similar) another clearance find. Mini Boden Ticking Stripe Suit, another item on the wishlist, meaning I will wait to purchase until it is on sale or look for something else. Crewcuts Terry Pom Pom Dress- I swear J.Crew's pricing changes every day. I just bought this last week for the price I have on my graphic but now it's back up to full price. Another example of why it pays to read their marketing emails. Rose Gold Saltwater Sandals in her closet- I love having a pair of metallic sandals in her closet because they can be worn to church and for play. Tan Saltwater Sandals - I've been buying my daughter salt water sandals each summer since she was a toddler and I love the tan ones best. I also have a pair and wear them constantly. *These do have a little bit of a break in period and I have my kids take them out of the box and then drench them in water outside to help them form to their feet and soften the leather once we make sure the size is correct. Adidas Pink Baseline Sneaker - she is dying to have these and I am won over by the pink too.